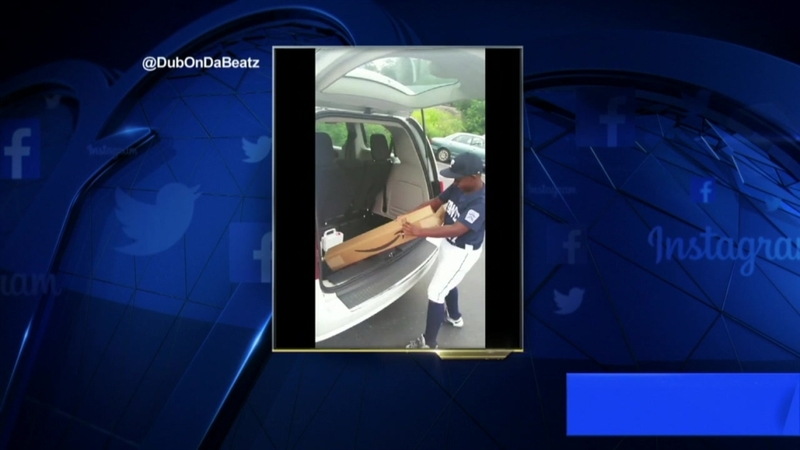 A Philadelphia little league baseball player was in for a surprise after he thought his dad wasn't getting him a birthday present. Devon Fowler told NBC10 he initially told his son, 12-year-old Braheim, that he wasn't getting anything for him for his birthday. "I told him I had nothing for him," Fowler said. "He had an attitude all day." The boy, who plays for the Taney Dragons little league team, was still upset Thursday as he played in his game. That's when Fowler put his plan into action. Fowler recorded as he told his son to get his bag out of the trunk of his car. To Braheim's surprise, he found a box sitting in the trunk instead of his bag. Inside the box was the exact baseball bat he had asked for as a birthday gift. Braheim began to tear up as Fowler reminded him that he didn't forget his birthday. "[His reaction] definitely surprised me," Fowler said. "I was expecting him to be happy but I didn't expect him to get so emotional." The video, which Fowler posted on Facebook, has gotten an overwhelmingly positive response and has been viewed over 52,000 times. "I didn't expect this at all," Fowler said. "It happened overnight. I'm not a social media kind of guy." Fowler, who is currently unemployed, shared advice for parents who are dealing with financial difficulties. "Just keep trying to make your kid happy," Fowler said. "If you got love for your kids they won't care about what you get them."